For those of you that know me personally, you may have heard me talk about my personal goal: I want to run 50 marathons, one in every state, by the time I turn 40. In these 50 races, New York City and Boston need to be two of them. This past weekend I traveled down to Miami for my third marathon and it was awesome. Despite my lack of training, I still managed a 4:32:54 and was in very little pain for running 26.2 miles. I felt really great physically but mentally, I was struggling. Through the miles I needed to find a pick-me-up, some motivation, and I felt that just talking myself through the race was my only option. However, it worked. I also had my support system at mile 25 with a bottle of Gatorade and then they ran the last mile with me! That is friendship right there! My next race is Nashville on April 28th. Anyone going to that one? I am so excited and love country so it should be a good time. Hopefully by April I don’t have to worry about black toenails anymore! Oh well, as many signs on the course said… Toenails are for Sissies. Another fascinating point from training is The Look. The Look is what I like to call the glances, the laughter, the hoots and hollers from non-runners. People who don’t understand running. It’s empowering to be running in negative degree weather and see people staring at me like I am crazy. It gives me a little push to keep going, knowing I have a gift that keeps me running and that I can do what so many wish they could or would never dream of doing. Running has so many strong points to it that no one outside of the sport ever understands. From an outsiders view, we’re all crazy. I think my boyfriend said it best at my latest half-marathon, “Everyone here is in dry-fit gear… why? What is wrong with just shorts?” Nothing, but to some people, they’ll just never understand. What things about running make you laugh and appreciate the sport for what it is? Last night I logged onto my blog only to realize I haven’t written very much about anything in the past few months. I feel like it is time for an update. First and foremost, I am not going to be running the Vegas Marathon this year. I’m pretty bummed about it, but life takes control and I simply have not had the time to get those long training runs in. I have moved to Columbus to pursue my career in Public Relations, and I am still looking for that first full-time job. I am working three different jobs right now (hence why I have not had the time to train for a race) as an Intern at a small PR agency called GREENCREST, a hostess at Ted’s Montana Grill and doing liquor promotions with a company based out of Florida for Jameson on the weekends. Needless to say, I am a busy girl! When I moved here, I was unsure of what was going to happen- or if I was going to stay, (as we all should know, my heart is in New York City and I cannot wait to end up there someday). Anyways, I moved here at the beginning of September and lived on my friend’s couch for a month and a half. Thank you for that Jessica. After deciding I may be able to start a career here after all, I signed a lease with a friend from school and we have been living at our new place for about three weeks. I love it. I just keep repeating that as I try to go on these runs… I have not started my training for the race yet, however, I have started training for training. (Yes, that happens.) I joined a local gym for a month in hopes that in a month I will be heading elsewhere soon and can join a gym in a new city. However, for now… I am going to daily aerobic classes such as yoga and Zumba (which I HIGHLY recommend) and lifting along with building up milage again on my feet. Well, at lease today’s workout is done with and tomorrow its back to the gym for some Zumba and another run! Does space camp lead to it? Random thought of the day: How does one become an astronaut? Sure, I know there are classes and certain majors to start in to get you there… but the process… how does it actually take place? 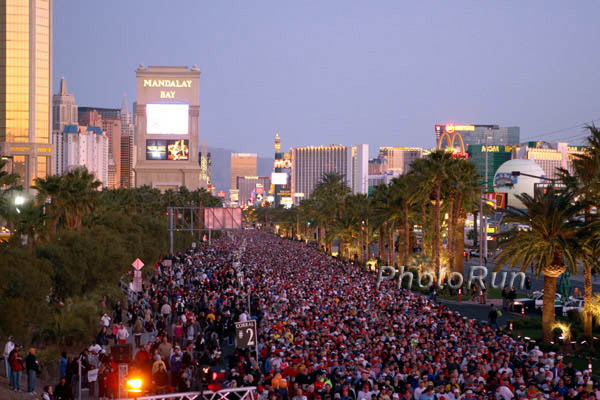 Las Vegas Marathon in 2010? ?